West Virginia, the "Mountain State", derives its identity from the Appalachian range which covers so much of its territory. It is these mountains which gave cover to the Hatfield clan during the feud with the Kentucky McCoys, which are veined with the coal deposits that sustained the state's economy for most of the 20th century, which lure ever-increasing numbers of tourists today, and which divide West Virginia from Virginia. 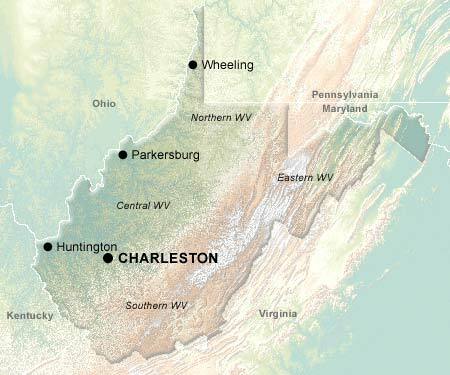 Until the Civil War, West Virginia was part of Virginia, but the uneven terrain of the west didn't lend itself to the slaveholding plantation economy driving the eastern part of the state, and secession was vehemently opposed by the northwestern counties. So when Virginia seceded from the Union, West Virginia promptly seceded from Virginia and aligned itself with the North. Harpers Ferry National Historic Park, one of many parks in West Virginia, commemorates two important events from the Civil War era: The doomed 1859 assault by abolitionist John Brown's band upon the town, and the 1862 surrender of 12,000 Union troops, the largest American capitulation prior to World War II. The 900,000 acre Monongahela National Forest features a wide variety of attractions, including the climber's fantasyland of Seneca Rocks, and a dozen rivers with great whitewater rafting. However, it's the New River Gorge National River that provides the best whitewater in West Virginia, or the eastern United States for that matter. The West Virginia economy was once dominated by mining and manufacturing, but both are in decline while tourism and government services are growing. With the relative proximity of Washington DC, and with West Virginia's spectacular mountains, forests, and rivers, it's easy to understand the trends.